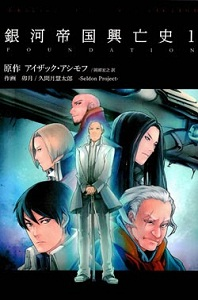 This is a manga adaptation of Isaac Asimov's "Foundation," a classic science fiction novel and the first published novel of the Foundation series. The story begins when the young mathematician Gaal Dornick arrives on Trantor, the capitol planet of a 12,000-year-old galactic empire, at the invitation of Hari Seldon. Hari Seldon is a mathematician who developed the science of psychohistory, which combines history, sociology, and statistics in order to make predictions about the future of large groups of people. To Gaal's surprise, he and Hari Seldon are arrested for treason shortly after his arrival! Hari Seldon has made a prediction that the Empire will fall in 500 years, after which there will be a 30,000 year dark age. He claims that nothing can be done about the fall, but that he can use his knowledge of psychohistory to shorten the following dark age to 1,000 years. The Empire's rulers are not thrilled with this news, and they exile Hari, Gaal and others who are involved to the remote planet of Terminus. Thus begins the Foundation, which must endure through the end of the Empire, and follow Seldon's plan to bring humanity through on the best possible path! 22-year-old Mabuchi Nobuko is the often-childish boss of a toy company. She decides that bath toys should be developed for adults, which results in a new line of bath buddies. Nobuko tests out these new toys, as does her little brother Sakuno. The prototype units are a boy doll named Yuzu and a girl doll named Roze, and they work to make bathtime as childishly fun as possible! Kaminato Hare is a loner middle school student, who doesn't much understand feelings (neither her own, nor those of others). Her parents send her to live alone in a relative's empty house on a rural island. The people Hare meets there are weird, but also kind of nice. First there's her cousin, Akasaki Maayu, who she can't seem to understand at all. 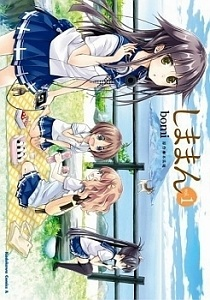 Then there are the two close friends, Ukita Sakuya and Nako Kairi, who creep into her house in search of a ghost, and end up deciding that Hare needs to join their team, due to her superior mystery-solving skills. Hare is used to being alone, but it looks like moving out in the country is bringing more people into her life! I was surprised and delighted this week to see a manga version of Asimov's Foundation! I haven't read the novel in years, but I think it's great that the manga might introduce the story to a new audience! Shimaman was a pleasant read as well, and seems to have a lot of potential for developing stories in future chapters. Ofuro no Tomodachi was a light, silly 4-koma, and, at least from the chapters I read, it isn't as risqué as it might sound from the description. If you haven't done so already, check out the scanlations of the mangas from previous shout outs which have been recently scanlated: sci-fi, school life, comedy Yuri Seijin Naoko-san (MH link).